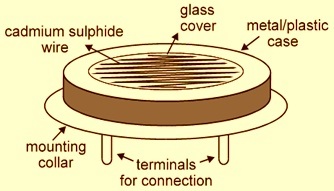 The general purpose photoconductive cell is also known as LDR – light dependent resistor. It is a type of semiconductor and its conductivity changes with proportional change in the intensity of light. There are two common types of materials used to manufacture the photoconductive cells. They are Cadmium Sulphide (CdS) and Cadmium Selenide (CdSe). Extrinsic devices have impurities added, which have a ground state energy closer to the conduction band - since the electrons don't have as far to jump, lower energy photons (i.e. longer wavelengths and lower frequencies) are sufficient to trigger the device. Two of its earliest applications were as part of smoke and fire detection systems and camera light meters. The structure is covered with glass sheet to protect it from moisture and dust and allows only light to fall on it. 1.) LDR and its characteristics When light is incident on it, a photon is absorbed and thereby it excites an electron from valence band into conduction band. Due to such new electrons coming up in conduction band area, the electrical resistance of the device decreases. Thus the LDR or photo-conductive transducer has the resistance which is the inverse function of radiation intensity. Here we must note that any radiation with wavelength greater than the value obtained in above equation CANNOT PRODUCE any change in the resistance of this device. The band gap energy of Cadmium Sulphide is 2.42eV and for Cadmium Selenide it is1.74eV. Due to such large energy gaps, both the materials have extremely high resistivity at room temperature. Now when the device is kept in darkness, its resistance is called as dark resistance. This resistance is typically of the order of 1013 ohms. When light falls on it, its resistance decreases up to several kilo ohms or even hundreds of ohms, depending on the intensity of light, falling on it. The spectral response characteristics of two commercial cells were compared in our laboratory. And we found that there is almost no response to the radiation of a wavelength which was shorter than 300nm. It was very interesting to note that the Cadmium Sulphide cell has a peak response nearer or within the green color of the spectrum within a range of 520nm. Thus it can be used nearer to the infra-red region up to 750nm. It was found that the maximum response of Cadmium Sulphoselenide is in the yellow-orange range at 615nm and also it can be used in the infra-red region up to about 970nm. 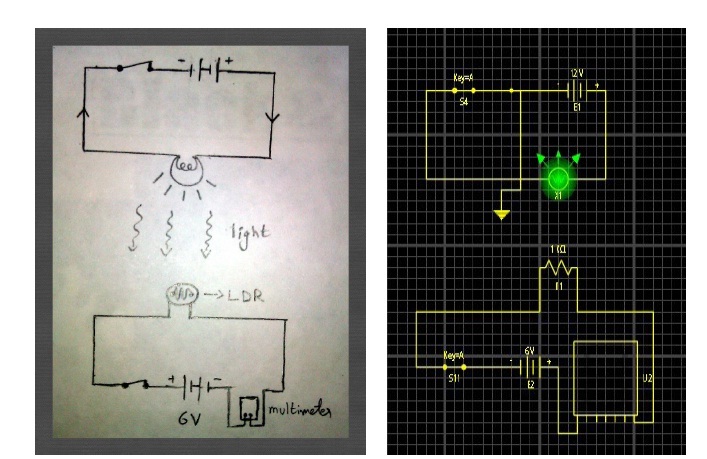 The sensitivity of a photo detector is the relationship between the light falling on the device and the resulting output signal. In the case of a photocell, one is dealing with the relationship between the incident light and the corresponding resistance of the cell. Like the human eye, the relative sensitivity of a photoconductive cell is dependent on the wavelength (color) of the incident light. Each photoconductor material type has its own unique spectral response curve or plot of the relative response of the photocell versus wavelength of light. Choose a specific position for the source and mount it using a holder, make sure it is stable.  Select the bulb with the lowest power rating and connect it to the holder as shown in the figure.  Connect the LDR, battery(6V) and the multimeter in series. 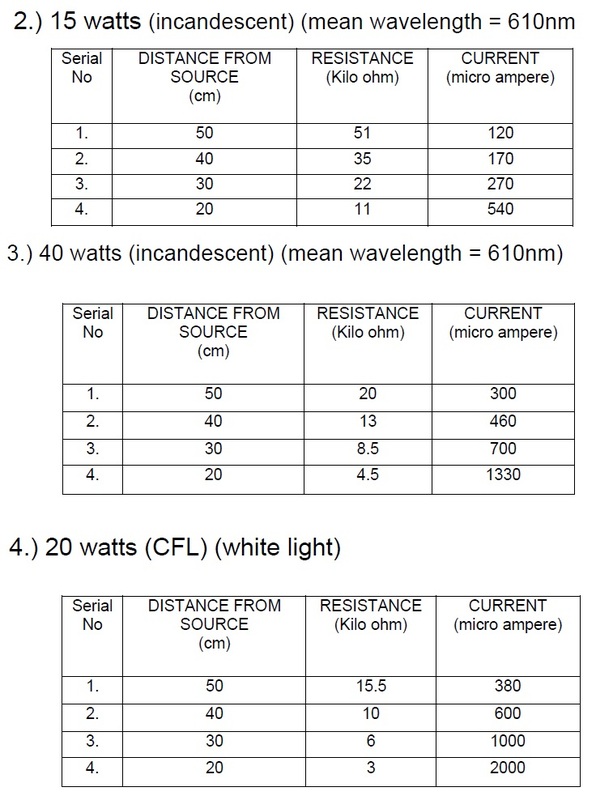  Set the multimeter to ohm section and select suitable range and measure the resistance with a bulb on.  Similarly switch to current section and move to micro ampere in the multimeter. This gives the value of the current. Lead sulfide (PbS) and indium antimonide (InSb) LDRs are used for the mid infrared spectral region. GeCu photoconductors are among the best farinfrared detectors available, and are used for infrared astronomy and infrared spectroscopy.  The LDR resistance decreases with increase in intensity of light and hence there is an increase in the flow of current.  There is an increase in the current as the distance from the source decreases.  The error lies within the experimental limit.